You travel across the limitless expanse of planes known as the Multiverse. As you discover new sources of mana, the source of all magic, you work to forge your arcane destiny. You control an arsenal of spells and call deadly creatures to your side. You are one of the most powerful beings in existence. You discovered your true nature when your Planeswalker spark ignited. This previously hidden connection to the Blind Eternities that lie between the planes is what sets you apart from the rest. But one of your kind hunts you for it. The brutal Garruk is tracking down Planeswalkers like youthe ultimate prey. A master of nature's ferocity, he is on your trail now. You must master your own magical path. Challenge other Planeswalkers and test your skills so that you can survive when Garruk comes for you! Not normally available in the US! Each MASTER CASE contains 6x FACTORY SEALED booster box displays. Each FACTORY SEALED booster box display contains 36 booster packs with 15 cards and 1 token or marketing card per pack in FACTORY SEALED, NEAR-MINT to MINT condition. Box may show shelf wear from storage and will not affect condition of the cards. Official Authorized Magic the Gathering CCG and Wizards of the Coast product. GERMAN, ITALIAN, or PORTUGUESE Language. We have described the item to the best of our knowledge. Item come from a clean, smoke free environment. We will gladly post additional pictures and/or details of item upon request. Please wait to pay until we send an invoice. Q: Can I pay by other means than the listed methods? It must be a secure method or we will not allow you to pay that way. Q: I paid twice or overpaid. Q: Are your cards, products and/or memorabilia authentic? A: Yes, unless otherwise stated, all our items are authentic and licensed with permission. Having been in business for over 10 years the owner has accumulated a vast collection of rare items. Q: The title/description says x4 4x, what does that mean? Q: I see auctions with multiple quantity listed and only one item described. A: Each of the quantity are in similar or identical condition. Ask to see if we have more than the listed quantities. Item must be brand new sealed and never been opened. Q: What if I do not receive my item when I expect to? Should I contact you or wait and see? Often a visit or call to your local post office will reveal that the package is waiting for you. Please read the following policies carefully! This policy is strictly adhered to and is required in order for us to maintain an accurate inventory and provide excellent customer service to all our customers. We are more than happy to help resolve any issues. §§§ Very Important Policies §§§. Some items shown in the images may not be included. Always refer to the title and description to determine what you will receive. If you don't pay, we can't prevent this. This should rate a 5 STAR. Please contact with any questions or concerns. 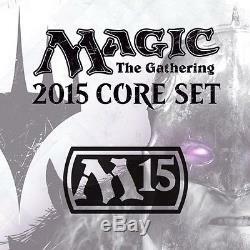 The item "Magic MTG 2015 Core Set M15 Factory Sealed Booster Box Pack Case The Gathering" is in sale since Thursday, June 5, 2014. This item is in the category "Toys & Hobbies\Collectible Card Games\Magic\ The Gathering\MTG Sealed Booster Packs". The seller is "toymo" and is located in Cerritos, California. This item can be shipped worldwide.